I have an absolutely ridiculous Christmas list to share with you. The majority of this stuff is priced waaaay beyond what I would ever expect anyone to spend, but in case Santa thinks I've been extra good, (Uh hmm <that's the guilty, throat clearing sound that's generally coupled with equally guilty-looking eye contact avoidance... you know the look, right?) I'll throw it out there ;) Honestly, I had a hard time coming up with this list... finding specific things I want. Isn't it funny how you can never think of anything you want when people actually want to know and get you something? Seems like it's so easy to want a million things when it's just a generic desire for clothes, a purse, whatever... but then Christmas rolls around, and people want specific ideas, and then it's like "Want? Me? Uhhhhhhhh...". 2) Camera Bag <That's a link to a cheaper bag that looks a lot like the one pictured above, but even better if you ask me. And it's only $44, compared to $120. That's what I'm talkin' about! 3) 18-200 Lens, geeeez that's expensive! 4) Purse, I don't know what I was thinking when I settled on this bag. I would never pay $70 for a purse... it's pretty though. 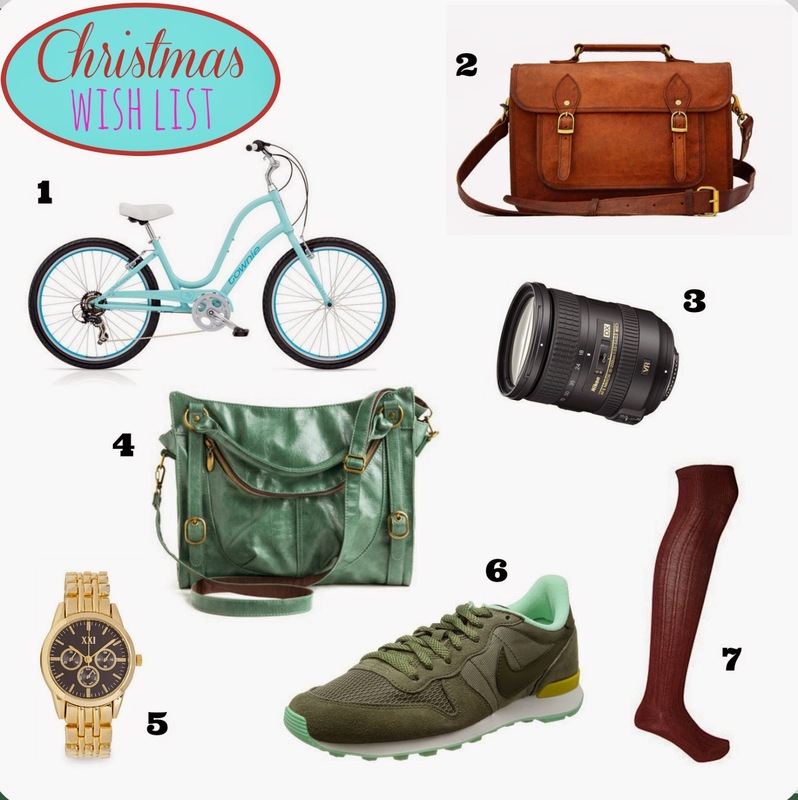 Clearly I've got a thing for that color (see #6 and bike option #2). 5) Gold Watch, looks like my original pick is no longer available, but this one is similar. 7) Over-the-knee Socks, and finally, one affordable item on my list. Now I need to go get started on my own Christmas shopping. And good luck in your own search of the perfect gifts for everyone on your list!